Technology is everywhere we look, and it seems like everything is being enhanced and improved in its capabilities. Electronic, computer and communications technologies in particular are constantly expanding both in capabilities and applications. Not only has the range of technologies changed, but it has also widened access to knowledge to such an extent that students as well as others now have to accept the fact that they need to be lifelong learners. It has been said - ‘The illiterate of the 21st century will not be those who cannot read and write, but those who cannot learn, unlearn, and relearn’. It is also true to say that - ‘Teachers need to integrate technology seamlessly into the curriculum instead of viewing it as an add-on, an afterthought, or an event’. Encouraging students to learn how to learn is, in my opinion, the most important aspect of education. At Alexander school, members of staff are constantly looking for ways to use technology innovatively and effectively. Undoubtedly, ever since the introduction of the Laptops and the Interactive Whiteboards (IWB) in all our classrooms, major changes have taken place in the way we teach or bring information and knowledge to our students. They have in fact become an integral part of our teaching and learning. These changes have been complemented by the fast internet access and the school network system, including the wireless environment. As a result, the world has been brought to the forefront of our classrooms, greatly benefiting the learning resources now available at our fingertips. 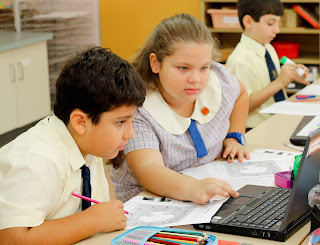 As I have stated in the past, gone are the days when we used computers at Alexander school to do ‘things differently’, the time has come for teachers to use the computer and other modern educational technology and do ‘different things’ in the classroom. The employees of the future need to be able to think outside the box and do different things in order to have a competitive edge over their counterparts. For this reason it was important that few years ago we were able to embrace the idea of using Goggle Apps for Education to empower our students - the next generation of administrators, CEOs, and technocrats, to give them the knowledge base that will enable them to become masters of their fields. It is proclaimed that modern technology has the power to change the ‘content, pedagogy and effects’ of education on the future generation. Schools and educators have a vital role to play in this. Students enjoy and demonstrate the joy of learning when they become ‘co-constructors of knowledge’ rather than one expert telling them what they know. Students of the 21st Century should be critical thinkers rather than mere ‘empty barrels’ waiting to accept deposits from their teachers. Google Apps for Education has helped us achieve this as a set of flexible, customizable tools that provides opportunities for students and teachers to work more effectively in a collaborative environment. This comprehensive, cost-effective solution which is entirely browser-based, has made it easier for students to work from any computer connected to the internet, without having to purchase expensive software to communicate or do their homework. This example of ‘Cloud’ computing has recently been extended and complemented in our school environment through another computing giant, Microsoft. Since the start of term, all new computers have been installed with Microsoft Office 365 for Education. The cloud based version of the full MS Office package, with the latest and familiar tools to help students and educators better communicate, collaborate and achieve more. Together with the Office apps for Education, they help to create dynamic learning experiences in and outside of the classroom. This has been another great and exciting step forward in our ‘Year of Growth’.